Our previous post was about Ready vocBlocks, the mini dictionaries or vocabulary blocks on different topics ready for you to learn. Today’s post is about ‘My vocBlocks’ which is another section of the vocBlocks.com website. 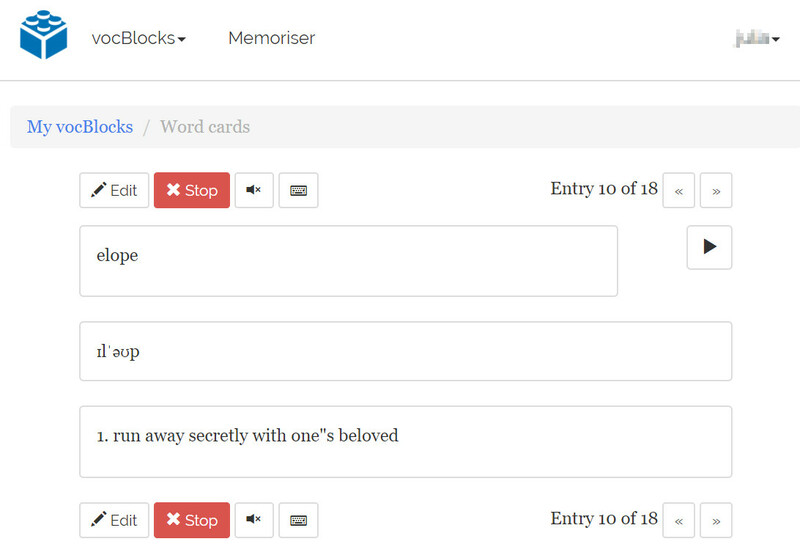 My vocBlocks is the place where you can create your own vocabulary blocks by recording the words you need to learn. You can record new words one by one or in bulk. In this post we will focus on recording words one by one as you come across them while reading a book or an article, listening to a podcast or watching a film. If you have lists of words which you would like to learn or if you need to record a list of new vocabulary for a text you are studying, you can use the Import function. You can find a separate guide on the Import function in this post. To record words or phrases one by one, you need to create a new vocBlock and then start adding words to it. To create a new vocBlock you need to press the ‘New’ button in the section ‘My vocBlocks’. - press OK to save changes and finish creating a new vocBlock. Let me go into a bit more detail on each of these fields just to give you some tips on how and what for you can use them. Name. If you create a vocBlock on some particular topic, you might want to name it accordingly. For example, if football happens to be your hobby and you would like to talk about it in your target language, you name the vocBlock containing football words ‘Football’. Description. This field can be used for any additional information you might have. 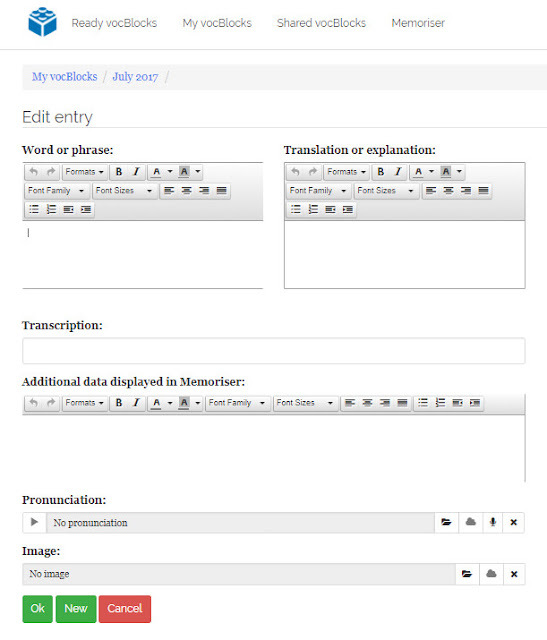 For example, you can record the links to the articles that were the source of vocabulary for this vocBlock. If you are a teacher and create a vocBlock for your students for practising new vocabulary, you can add instructions to this field or any pertinent information for your students. The box ‘Sort in alphabetical order’ just below the description field, is for the cases when you need to revise the words you have recorded in the order of their input and not in the default alphabetical order. For example, you have been listening to a radio drama from the podcast ‘BBC Radio 4 - Drama of the Week’ and have recorded new vocabulary from this drama in a vocBlock. To make the learning of this vocabulary easier, you would like to revise it by running word cards in the order you came across these words and phrases in this radio drama, so that you could remember them based on the development of the plot you enjoyed. In this case, you just need to untick this box. The box ‘Share with other users’. When this box is ticked, the vocBlock appears in the ‘Shared vocBlocks’ section. So you can share any vocBlock you have created with your friends who study the same language or with your students if you are a teacher. Don’t forget to send the link to this vocBlock to the people you want to share it with. Word language, translation language. Here you need to choose your target language from the ‘Word Language’ drop down and your native language from the ‘Translation Language’ drop down. If your target language level is quite high, so that you would like to bypass your native language and have explanations or synonyms in your target language in the ‘Translation or Explanation’ field, you need to choose your target language from the ‘Translation Language’ drop down as well. For example, if you study English and would like to have explanations in English as well, you need to choose English from both drop-downs. If you are studying more than one foreign language at the same time and would like to boost the foreign language you know better, you need to choose this foreign language from the ‘Translation Language’ drop down. For example, if you are studying German at intermediate level and would like to boost your English which you are studying at advanced level, you need to choose German from the drop down for the ‘Word Language’ field and choose English from the drop down for the ‘Translation Language’ field. Image. If you would like to have a custom image for your new vocBlock, you can drag and drop or upload a picture in the ‘Image’ field. This picture could reflect the content of this vocBlock or could be just a picture you like. If you have a series of vocBlocks, for example, vocBlocks for different episodes of the same podcast or for different episodes of the same TV series, you can make this series stand out by adding the same image to each of the vocBlocks in this series. 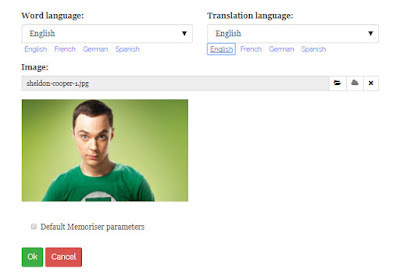 For example, a picture of Sheldon for your vocBlocks with vocabulary from ‘The Big Bang Theory’ TV series. 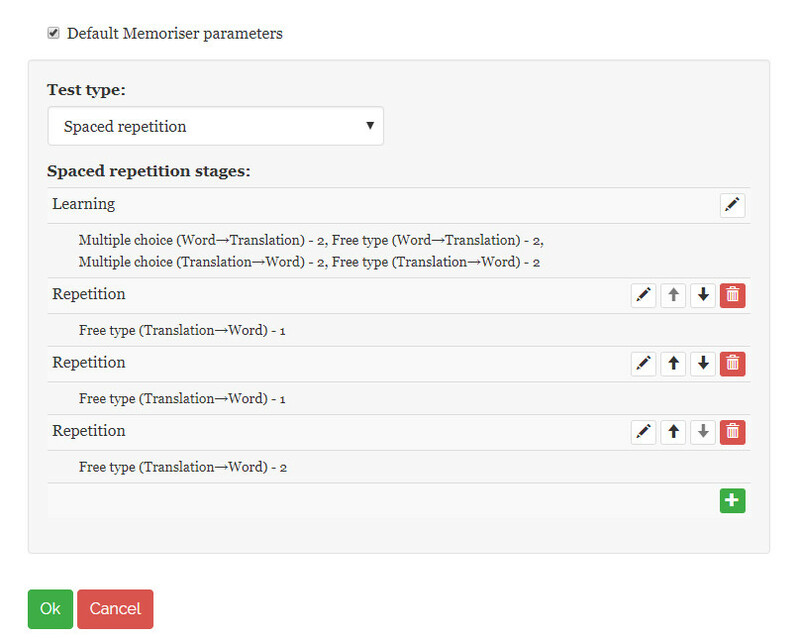 The box ‘Default Memoriser parameters’, once ticked, allows you to customise Memoriser exercises for this vocBlock. For example, if you feel that you need just passive knowledge of the vocabulary you have recorded in a particular vocBlock, you can delete all free type exercises from the list (please tick the box first for the list to appear). 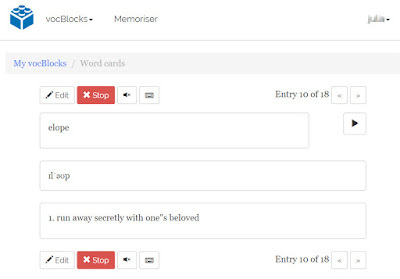 In this case, Memoriser will be creating exercises with only multiple choice questions for this particular vocBlock. 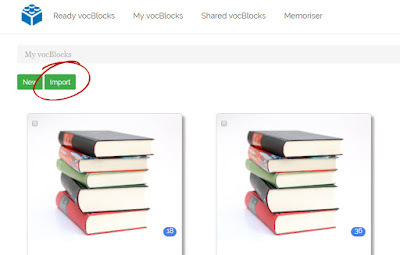 If you feel that the vocabulary you have recorded in a vocBlock is not too difficult, you can delete all multiple choice exercises from the list and Memoriser will be creating only more difficult, free type exercises for this vocBlock. If you are not sure what type of exercises you would like to do at the time when you are creating a vocBlock, you can always customise exercises in Memoriser later, once you have started learning this vocBlock. In this case, you don’t need to tick the ‘Default Memoriser parameters’ box and make any changes to exercises when you are creating a vocBlock. 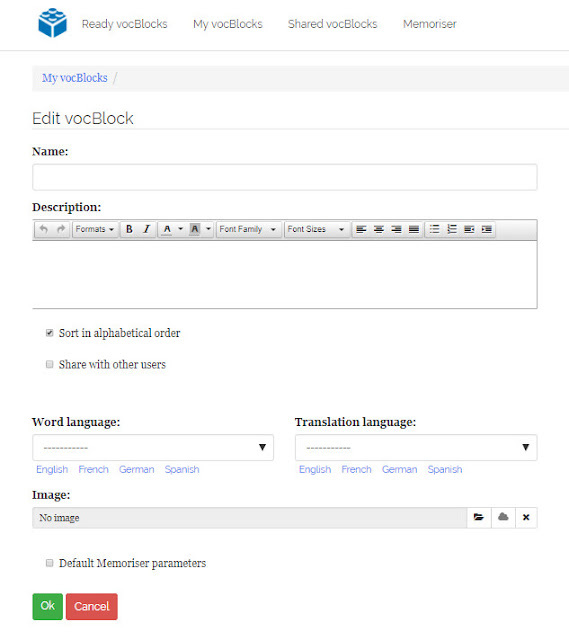 Once you have created a new vocBlock you can start adding words or phrases to it. - attach or drag and drop a picture for this word (optional). - press OK to save changes and finish adding the new word. Alternatively, press ‘New’ to save changes and start adding the next new word. Again let me go into a bit more detail on each of these fields just to give you some tips on how and what for you can use them. Word or phrase. This field is for the vocabulary you would like to learn. As any other field for text on this page, it allows you to format text the way you want by selecting different typefaces, colours, etc. For example, to remember words easier you can colour code them like it’s done in one of the Ready vocBlocks ‘Musical Instruments’ where each group of instruments (brass, keyboard, percussion, strings, woodwind) has its own colour. Or you can simply make some most important words stand out by choosing a bigger font or a different colour for them. Once you have input the new word into this field, just below it, suggested variants from the built-in dictionary will pop up. If you would like to look up this word and have translation/explanation, transcription and audio pronunciation for this word added from the dictionary, you will need to click the word you require from the suggested variants. For example, if you would like to look up the word ambivalent in the dictionary and record it for learning, you will need to type it in the ‘Word or phrase’ field and then click on it below. Translation or explanation. This field is filled in automatically, once you have clicked one of the suggested variants from the built-in dictionary. 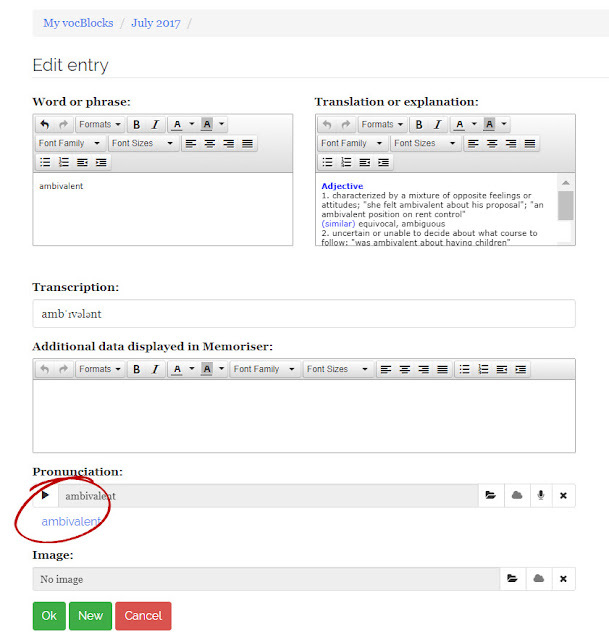 You can always customise the translation or explanation from the dictionary, for example, by deleting all variants of translation or meanings in the explanation apart from the one you have come across yourself. For example, you would like to learn the word ambivalent. This word has two meanings: characterized by a mixture of opposite feelings or attitudes and uncertain or unable to decide about what course to follow. In the article you are reading, this word is used in the first meaning, so you can delete the second one and concentrate on the one you have come across so that you could learn this word easier based on the context that you will remember and associate with this word. If you would like free type questions with the ‘Word-Translation’ direction included into your practice, you might want to choose synonyms over explanation for the words you would like to learn (you don’t really want to memorise the explanations, do you :) ?). In this case, you can customise the information from the dictionary by deleting explanation altogether and leaving just synonyms. For example, for the word ambivalent you can delete the explanation we mentioned above and just leave the synonyms equivocal, ambiguous. Additional data displayed in Memoriser. This field can be used for any notes you would like to make that will help you learn the new word or phrase. For example, you might want to copy and paste the context (a few sentences) in which you have encountered the new word, so that you could recall the situation or idea described in which this new word reveals its meaning. Context also helps you see how this new word is used grammatically and its collocations (other words it is used with). You can also think of and record your own sentences with this word here and have them as reference when you learn and revise this word later. By the way, if you use vocBlocks LookUp while reading online, you don’t need to record context manually as it will be recorded automatically along with the new words you look up with our free browser extension. Pronunciation. 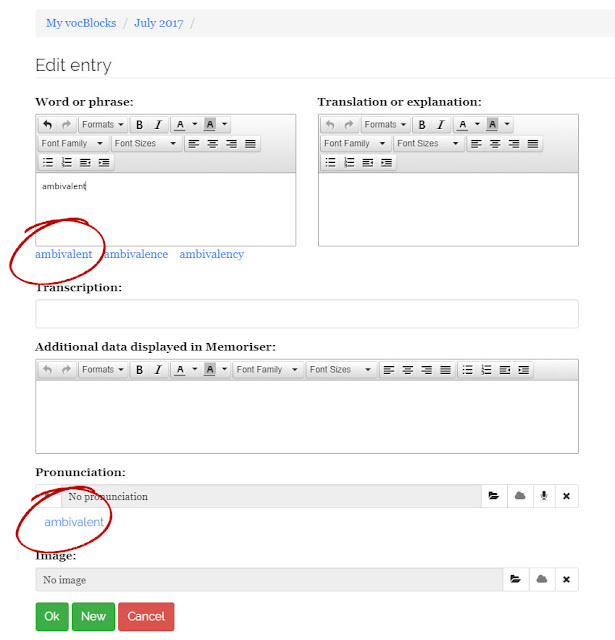 This field is filled in automatically, once you have clicked one of the suggested variants from the built-in dictionary. When you learn words with audio pronunciation, you remember them better. If you are learning your words during lunchtime in your office and don’t have headphones at hand, don’t worry: you can always mute audio in Memoriser and practise with the sound on next time. 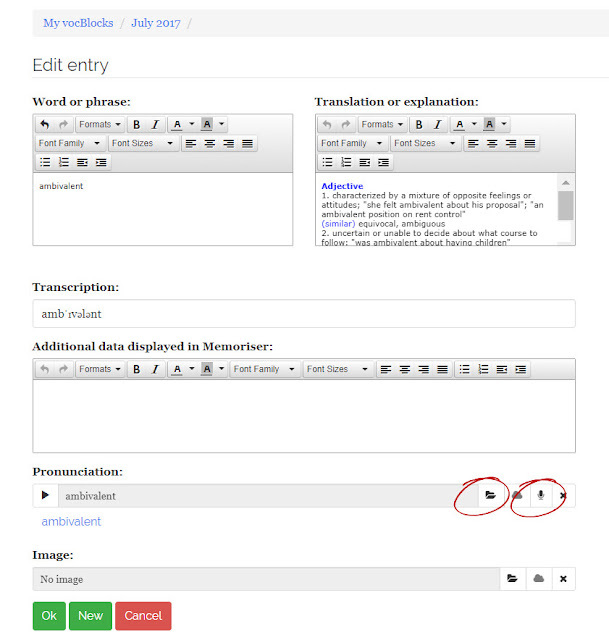 If you have your own audio recording of the word or phrase, you can always drag and drop or upload this file to the pronunciation field. Alternatively, you can record yourself pronouncing this word or phrase. Image. This field allows you to drag and drop or upload an image illustrating the word or phrase if you would like to back your learning efforts with some visual aid. For example, you can upload pictures of your friends to learn adjectives describing personality. If you use your phone for reading and it’s not convenient to copy and paste sentences which you would like to record as context for your word, you can take a screenshot and add it as an image for the word or phrase you would like to learn. For words you struggle to remember, you can create visual mnemonics and upload these images to back your learning. For example, for the word concubine (a woman who lives with a man but has lower status than his wife or wives in polygamous societies) you could add an image of a cube and a sad lady prompting you to remember this word. We hope that you find this short guide on My vocBlocks useful. But if we have missed anything or you have a question please do not hesitate to drop us a line. P.S. If you read a lot online, download the dictionary extension vocBlocks LookUp which is specifically designed for those who would like to grow their foreign language vocabulary more productively through reading. This post offers a guide on vocBlocks LookUp if you would like to learn more details.